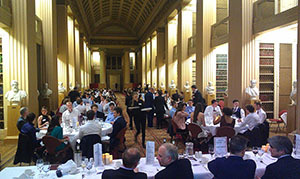 The first Engineering Networking Dinner was held on the evening of the 1st of October in the spectacular surroundings of the Playfair Library in Old College. Organised entirely by a committee of students from the Chemical Engineering Society, sponsors included Petrofac, ConocoPhillips, Safetec, BP, Diageo, EnQuest and ExxonMobil. Nearly 150 students and industrial attendees enjoyed a champagne reception and dinner. Chemical Engineering alumnus Tom Pringle gave an inspiring after dinner talk on how to communicate engineering ideas to round off the evening. The organising committee should be congratulated on a very successful evening, which is set to become an annual event, allowing students and industrial guests to meet in an informal setting.